It is no secret that Latvia is rich with heritage trees. We go to see and admire them, and to measure their girth by hugging them, as we have done from childhood. 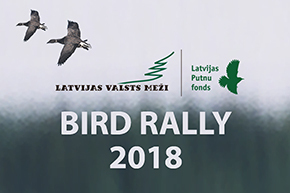 Also in state forests the number of these trees continues to increase, among them, in the LVM Southern Latgale region, where at the end of last year an impressive crack willow (Salix fragilis) has been surveyed. “The tree girth at breast height of this tree is 4.5 metres, which makes him worthy of heritage tree title. In state forest we usually get information about common oak or Scots pine and this is definitely a rarer case!” says environmental planning specialist of LVM, Sandra Līckrastiņa. Crack willow is a small to medium-size willow tree that can reach up to 15 metre height. It has a wide and round crown, but bark has fissures and grey colour. This willow often grows beside water reservoirs, in river valleys and is common in all Latvia. Willows are common not only in all territory of our country, but also in Latvian folk-songs. Frequently this tree is linked to old Latvian mother deity Māra, to whom, at this tree, the ancient Latvians sacrificed butter, milk and cheese.